No matter how much a curator knows about his or her subject, you never know when you are going to learn something new. I specialize in the history of early aviation, but that was the last thing on my mind as I pedaled my bike into Ewing, Nebraska (pop. 405), around 2 p.m. on September 7, 2009. A friend and I had set out from Deadwood, South Dakota, five days before, headed south through the Black Hills on the Mickelson Trail. Now we were riding east across northern Nebraska on the Cowboy Trail. When I pulled into Ewing, my buddy’s wife Bonnie, who was shadowing us in a van, pointed out a large mural on the side of a building. It was a painting of an early Curtiss-type pusher biplane. I rode over for a closer look and was surprised to discover that the building, the town library, was open on Labor Day. I went in and introduced myself to the librarian, Idella Tuttle, who explained that she had an appointment the next day, and had spread the word among the townsfolk that the library would be open on Labor Day instead. On top of the library shelves I spotted some framed photographs of the old pusher airplane, and while I inspected them, Tuttle called Jerry Tomjack, the local aeronautical historian. He arrived in his pickup three minutes later, and charged through the door expressing doubt that a Smithsonian curator had actually found his way to Ewing. “You people just don’t come to small-town America,” he said. I assured him that in this case, one of “us people” had actually bicycled into this small town. The airplane depicted in the mural, Tomjack explained, had been built by the seven Savidge brothers—George, John, Joe, Dave, Matt, Phillip, and Louis. The brothers grew up at the turn of the century just south of town, and had a reputation for equipping the family farm with all sorts of ingenious inventions. They launched their flying machine experiments with small gliders, enlisting the farm cats as test subjects, then moved on to larger machines that they rolled down the barn roof and into the air with a brother aboard. With that experience, they set to work on a powered machine based on the classic early biplanes of Glenn Curtiss. The pilot sat on a seat salvaged from a mowing machine. The frame was constructed of wood and metal tubing, while the wings were covered with shellacked muslin. They purchased the engine, propeller, and wheels from an aeronautical supply house, after consulting, one local historian believes, with the knowledgeable staff of Ewing’s own Spittler Brothers Hardware. 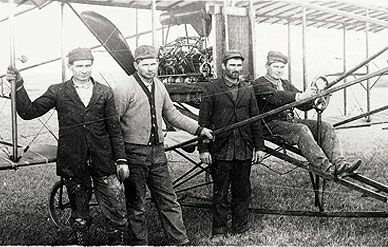 They made their first public flight from a nearby field on May 7, 1911. Buggies, wagons, and even the occasional horseless carriage conveyed a growing number of spectators to the Savidge place. It was the beginning of a five-year period during which the brothers made occasional flights in other parts of the west. Back in Ewing on June 17, 1916, Matt, regarded as the most daring of the boys, took up a new airplane and crashed to his death. It was the end of the Savidge brothers’ aeronautical career. We would be heading back through town early the next morning, and Jerry promised to tape an envelope with additional information about the Savidges to the monument that the town had erected in their memory just off the main street. When we pulled up, there was Jerry, envelope in hand. He wanted to give it to me himself. When I returned to the Museum the following week, I immediately checked our archive, only to discover we had no file on the Nebraska brothers. Nor were they mentioned in the very thorough aeronautical American Early Birds division files, compiled many years ago on those who flew before 1915. Thanks to Jerry Tomjack and Idella Tuttle, that situation has been corrected. The National Air and Space Museum came to Ewing, Nebraska, after all, and learned something in the process.